A conversation with Prof. Ryan Bubb (N.Y.U. School of Law), Prof. Teresa Ghilarducci (The New School), and J. Mark Iwry (The Brookings Institution), moderated by Prof. David Kamin (N.Y.U. School of Law). Presented by the N.Y.U. Journal of Legislation and Public Policy. Hosted by: The New York University Journal of Legislation and Public Policy. Date: Thursday, November 16, 2017, 12:30-2:00 P.M. Without pensions, and with inadequate personal savings, retirement security is out of reach for too many Americans. Low-income workers face particular difficulty as they grow older, as many hold jobs that do not offer any access to retirement savings plans, and their Social Security benefits stand to be much less generous than those received by higher-income individuals. Many policies could help to solve our nation’s retirement problem, however, including broadening access to retirement savings plans, adjusting how retirement plans are structured, and making changes to the federal tax code. 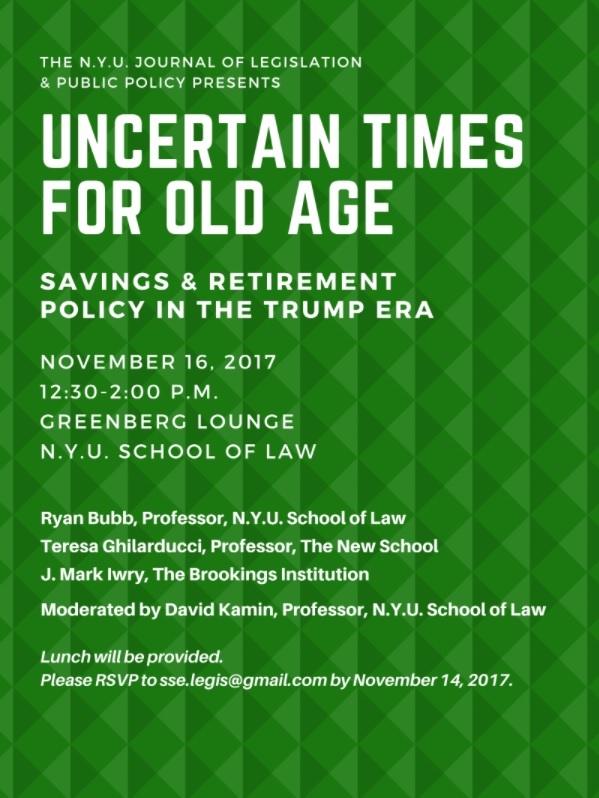 With tax reform proposals currently before Congress and discussion of major changes to saving incentives, come join the N.Y.U. Journal of Legislation and Public Policy as we reflect on the Trump Administration’s and Congress’s actions in the retirement field so far, and the prospects for improving retirement outcomes as the tax plans move forward. The last century saw an extraordinary reduction in elderly poverty—what can we do to make sure it does not increase in this one?